Join the Arizona Trail Association and the Coronado National Forest in celebrating Latino Conservation Week building new Arizona Trail! We have started a project in Happy Jack, just southeast of Flagstaff, to get the trail off of old forest roads and onto brand new singletrack trail. This is the first major trailbuilding project on the AZT since 2015, and we're especially hoping to get first time trail volunteers and outdoor enthusiasts on board! Participants should be prepared to walk up to 2 miles over uneven terrain carrying a tool. Tasks include everything from digging and moving big rocks to trimming vegetation and raking dirt. Other jobs include breathing fresh air, enjoying sunshine and getting dirty. No special skills are needed except a desire to work hard and give back to the trail community. Because we will be using heavy tools, please no children under the age of 14 for this event. For other family-friendly events, please contact us at volunteer@aztrail.org. Lunches and snacks will be provided. Participants should bring a bag or backpack and at least 2 liters of water per person. Personal protection equipment such as work gloves and eye protection is recommended, but we will also provide if you don't have your own. Carpool and shuttle options may be available from Flagstaff. The "address" listed is for the shuttle location. 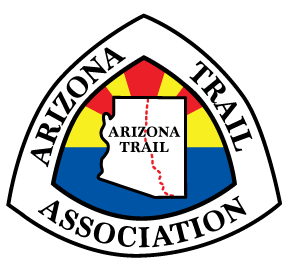 Questions: For Questions about this event, please contact Wendy Lotze with Arizona Trail Association at 520-730-8182 or wendy@aztrail.org.